collegiate uds builds - The BBQ BRETHREN FORUMS. Hello everyone! I am new to this site and thought I would share a couple of pictures of my uds builds. I live in SC as you can tell from the uds'. I have been building uds' for a few years and entering bbq contests. I started out building plain black ones but someone wanted me to do a Gamecock one and it took off from there. Just this week I have to build a Gamecock an Alabama and a plain one. As you can see I like to add an entry door on my smokers in case someone wants to add more wood chips/chunks. After building so many I have perfected the draft system on them and these babies will hold whatever temp. you desire and will burn around 10 hrs. at 225. I will post more pictures of the charcoal basket and draft system but I am at work right now so I have limited pictures. Wow cant wait to see some more pictures. Great looking UDS!! Just regular Rustoleum or whatever paint you want to use. Most people don't know that regular paint will hold up to almost 450 deg. The only time the paint will come off is if you have a bad grease fire or something in the drum. aqua, that is one fine looking drum there bro. About as nice as I have seen on here. A little more specs would be helpful as 10 hours at 225 is a pretty short burn for a UDS. What is your setup? Love the gloss look you did and it would be nice to see more collegiate drums posted. Nice job. Thanks for the replies. Whenever I get a chance to post my charcoal basket on here you will see why on the 10 hr. burn time. My charcoal basket is a little on the small side but I don't have to make them which is why I use it. Plus it is made from stainless. I usually only put about 6-7 lbs. of charcoal in it. If a longer burn time is needed or higher temp. and longer times it is easy to add more charcoal through the door on the front without opening the lid and losing all your heat. I cook boston butts a lot on them at 250 deg. and usually have to add a few coals once before they are done. I flip my butts half way through anyway so that is when I usually add a little more coals. Works good for me and haven't had any complaints from anyone else. Butts are the only meat I have cooked where I have to add more coals. aqua, doors on a UDS have always been an issue. Yours looks pretty heavy duty and looks like it seals well. How did you fab it? I see why 10 burns are what you get if you have that small of a basket. Other than butts and brisket, that will work on about everything else. Looks good. Welcome fellow Carolinian! Nice drums! I can't wait to see the fire basket and more pics. Meat, the doors are made from sheet metal you can get at lowes and rolled to the shape of the drum. I use black rubber gasket material to seal it so smoke can't get out and rain can't get in. There is no place that rain can get into these smokers. 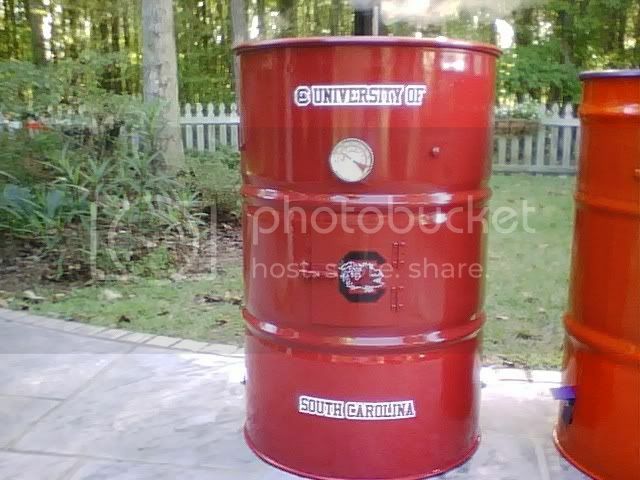 This looks like a pds pretty drum smoker. Now Penn State blue and white would look a little better. I can do it! Go Nittany lions!